My fear that my belly would get bigger grew when we migrated from Asia to America to join most of our extended family. My aunts, who had all been slim as girls in Philippines, had turned into plus-size women with bellies big enough to fill their laps. During the taking of family photos they would jostle to get behind each other or insist on sitting in a row with the dining room table in front of them to hide their stomachs from view. “You don’t want to end up like your aunts,” my uncle would say, half-joking, as if their bellies had become a cautionary tale about what could happen if you let yourself grow too much. Like my older female relatives, I also tried to make my belly “disappear.” In my teens I trained myself to stick my chest out and pull in my tummy, and I stayed in this uncomfortable position for years, even as I subsisted on half-breaths because that’s all I could take in with my body constricted this way. I wanted my stomach to look like what I saw in the pages of Seventeen and in the movies. It wasn’t until my thirties that I began to see my belly differently. 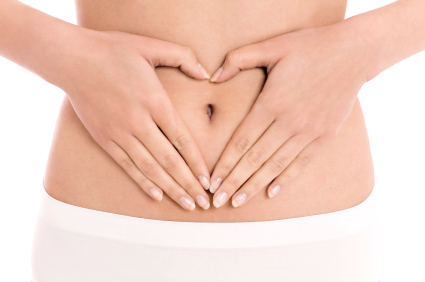 While studying a subtle body movement practice for women called the Tantric Dance of Feminine Power ™, I got to experience the female stomach in a whole new way. To learn this dance, I had to relax my upper body and release my belly. I couldn’t secretly keep my tummy tucked in because the teacher wanted us to wear clothing that would allow her to see how the movement was happening in our bodies. It was like taking part in a belly revolution. Wearing fitted tank tops, women let their bellies be seen. Some dancers would even lift up their shirts to leave their midriffs bare. In this class, I was treated to the sight of bellies of all ages, shapes, and sizes: fat bellies, skinny bellies, baby bump bellies, stretch-marked bellies, scarred bellies, and toned bellies. No two bellies looked the same. At first it was startling to see so many exposed bellies that didn’t appear at all like how women’s abs are “supposed” to look. But it was also liberating. I realized that my belly, like the tummies of my relatives, looked exactly the way all female bellies are supposed to look: real and custom-created to fit each woman. I began baring my own belly when I danced, reveling in letting all of me be witnessed. It felt so good to stop holding such a big part of me in, and for the first time in decades I was physically able to inhale and exhale in full breaths. I’d like to say that since my “awakening” I ignore the pressure to conform to the photoshopped images of female bodies that I see in the media every day. If only this were true. There are still moments when I find myself scheming ways to slim down my belly. During times when I am able to go to the gym often and my abs are more toned, I can’t help but feel sexier, more desirable—even as I know that this is absolutely wrong and damaging not just to me but to all women. Still, there are now days when I really am better about accepting my belly in its au naturel state. If only I were brave enough to unapologetically embody the fullness of me out in the world all of the time. I can tell I’m really going to love your blog. I like your gentle reminder that each belly is real and custom-created, and I always welcome messages that encourage us to embrace rather than change our own unique-ness. It can be difficult to embrace ourselves as we are sometimes, but as you said, it’s very liberating when we do. Thank-you. Good story hun. I’m so with u on the belly. Like how u always stay true or as u always say “be ur authentic self.” Love u. Thanks, Joyner! You know how much having you on my side inspires me. Love you, too. I like this. We should give ourselves a bit of a break sometimes, and just be ourselves. It’s too much to try and be everything that the media/society seems to want us to be. We can’t be career women, mothers, lovers, sisters, and totally fit surfers/gym bunnies/ninjas etc… all at the same time. Plus, evolution requires us all to be unique, that is how a species prospers. Yes, Sarah! And I think that the more of us that do choose to live by this, the more the world will have to change to embrace this “standard” of how women are/want to be. I love what you say about evolution mandating that we be unique so our species can thrive. Always slender to thin in build, I never thought I’d acquire my mother’s middle-age ‘tummy’. I’m not proud to say that I was rather smug in my assumption. Well, genetics ruled, and I must admit I’m still trying to re-shape my torso back to the form that feels like mine. I know better, but I haven’t yet come to terms with the inevitable. Cultural, personal, vanity mother issues…I don’t know, but I will now go do 40 Pilates sit-ups. Thanks for reading and sharing your own experience, Sunday! It’s such a complicated dynamic. I wish all women would ban together and collectively decide that our respective bellies, exactly as they are, are the standard of beauty. Your blog is so important!!! Thank you, Kristin! For reading, this profound quote by Geneen, and your wonderful words about my blog. You made my afternoon. I’ve always had the kind of tummy that sticks out no matter what shape I’m in. Like you, I’ve struggled (and am still struggling to some degree) to accept it. I love that you wrote about this here, it’s not something that I generally talk to people about. Your writing get’s it out in the open and reminds me that my plight is everywoman’s plight. I used to work at a counseling center where we had a “Love your Genes” day. On this day we all got to wear jeans and went to seminars that taught us how to help our clients come to terms with their bodies. I always felt uncomfortable on these days because I felt like a fraud as a psychotherapist because I wasn’t comfortable with my own body. How could I help my clients with this if I couldn’t even help myself? I think I am getting more comfortable with my body, in recent years, but I bet those dance classes you take would help me even more. I should look into that!! Celeste, I can totally relate. I’m absolutely passionate about celebrating the female body and still I wrestle with fully celebrating my own- how to reconcile?! But based on the responses I’ve been getting, am guessing that this struggle is common only no one ever talks about it so how would we know this? I love the concept of a “Love Your Genes” Day and how you worked with clients to accept their bodies. I’m guessing you were probably very supportive and that you gave them a beautiful mirror through which they could see themselves with new eyes. Yes- the Tantric Dance of Feminine Power is an amazing movement practice. From what I know of you from what you’ve shared of your blog, I think you would love the class. Reading each line all I thought was yes, yes and yes! I can empathise with everything you were saying about filipino women’s bellies – similarly my genetic ancestors would probably have sat around all day making and eating pasta! Perhaps I should have a look into that Tantric Dance of Feminine Power – sounds like an interesting read! Please keep your posts coming, brilliant. Thank you, I will! 🙂 Kittygotclaws, so interesting to hear that your experience with your Italian (?) lineage is like that of my Filipina one–and a reminder that the personal is often universal. Yes- the dance is pretty phenomenal. I highly recommend! Ah, your blog is a great find! I love this post– though I still can’t imagine baring my belly to anyone! I love imagining that dance class though… what an incredible teacher she must have been. Thank you, Aussa! I agree- the belly is such a vulnerable place to bare. I was really lucky to find a space and a teacher that allowed me to feel like it was safe and wonderful to let my belly dance along with the rest of me. I love this post! My relationship with my belly is exactly the same. I’m glad you’ve found acceptance and I hope I can manage the same someday! He liked my miniseries on blogging as well. I sent him this belly post. What a beautiful poem. Thanks for sharing and the intro. I will definitely say hi, Diana! Thank you for sharing the links, Kevin! I think this project is really wonderful. I think it’s healing for women to see photos of their bellies that are not photoshopped. Thank you for reading and your commenting. Thank you so much for acknowledging that despite a genuine desire to love your body, there are still times that it is a struggle. I have recently started working out and being healthier, and the changes to my body have been shocking. Things don’t stay where they used to, and I found myself discouraged. The most important thing I have learned- is that I have to actively love my body in order to get healthier. I have to care for it, and do the best I can every day to make better choices. I love your blog, and I am so glad to see so many honest reflections. Nice to meet you as well. I look forward to reading more. This is such an important post/topic. I’m glad you have written so crisply and honestly. I am still amazed at how much I can invest so much in relationships with others (building that trust, caring, etc. ) compared to how much I can divest from myself. And its not like I am doing this as a trade off. Thank you.